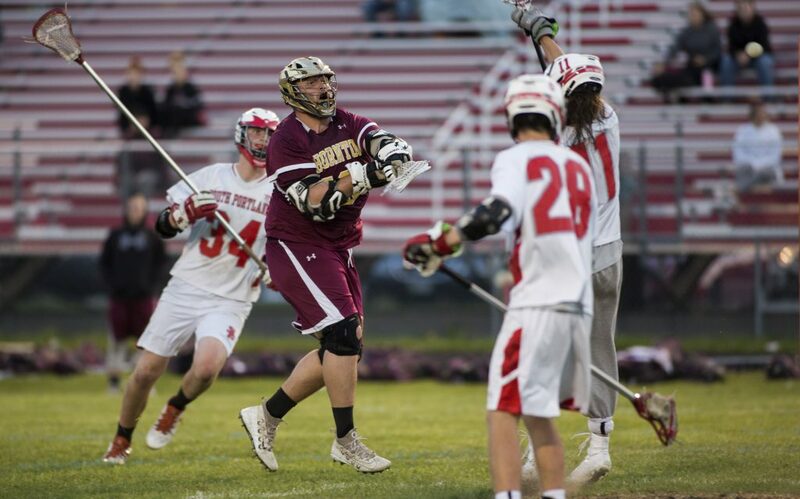 The undefeated Golden Trojans hold South Portland scoreless in the second half on the way to a 14-4 win. 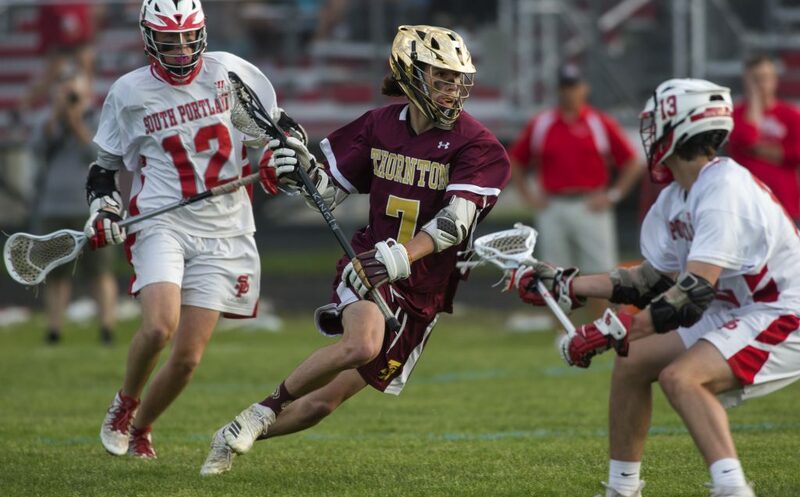 SOUTH PORTLAND — Thornton Academy’s boys’ lacrosse team is undefeated and atop the Class A South Heal point standings, but the Golden Trojans are far from satisfied. After reaching the regional final three of the past four seasons and losing each time, the Trojans are bound and determined to go all the way this spring, and they took another positive step in that direction Wednesday evening at Martin Memorial Field against a South Portland squad eager to move up the standings. 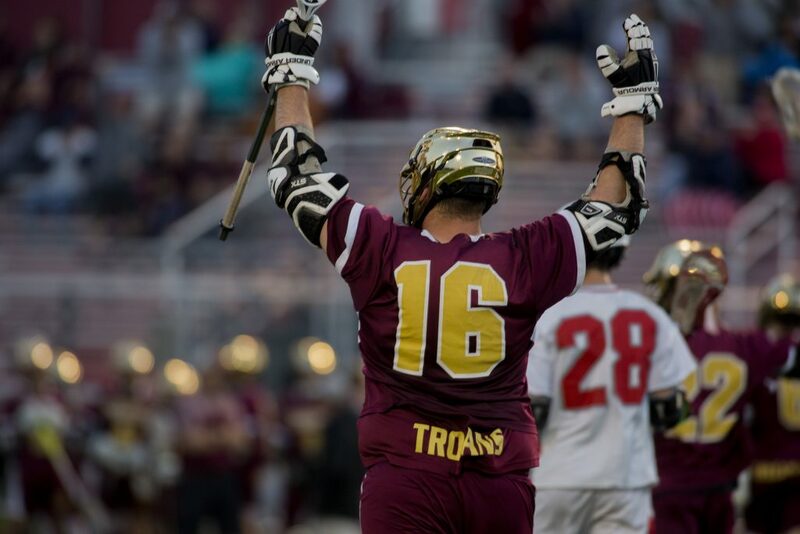 The Trojans never let the Red Riots get comfortable, taking a 4-1 lead after one quarter, extending it to 8-4 at halftime, then holding South Portland scoreless in the second half to roll to a 14-4 victory. The Golden Trojans (9-0) took a 2-0 lead behind goals from Thomas Levasseur and Noah Edborg, and after the Red Riots (5-4) got on the board when Cooper Mehlhorn set up David Fiorini, Wyatt LeBlanc and Levasseur added goals for a 4-1 advantage after 12 minutes. South Portland tried to hang tough in the second quarter, first pulling within 4-2 on a nice individual goal from Aidan Schifano. Then, after the Red Riots fell further behind when Tanner Weeks and Edborg scored for Thornton, South Portland cut the deficit to 6-4 on goals from Jack Tierney and Mehlhorn. But the Red Riots didn’t score again and Thornton Academy slowly pulled away. By halftime the lead was back to four, thanks to tallies from CJ Labreck and Edborg. 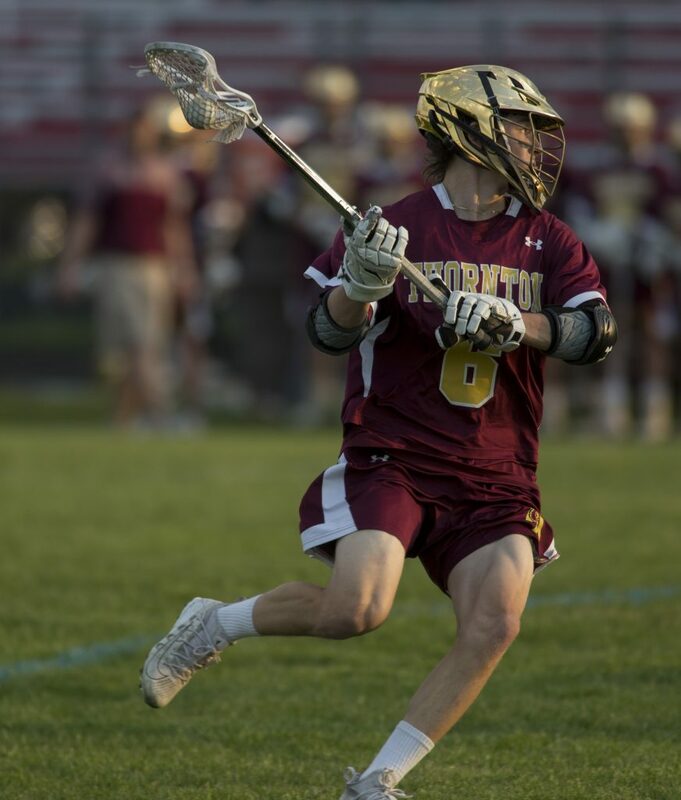 Edborg scored again early in the third quarter and Nathan Varle made it 10-4 late in the third. Down the stretch, Edborg set up Jack Webb for a goal, Labreck scored unassisted, Webb struck again, and with 15.3 seconds left on the clock, Edborg scored his fifth goal while Thornton was a man up. 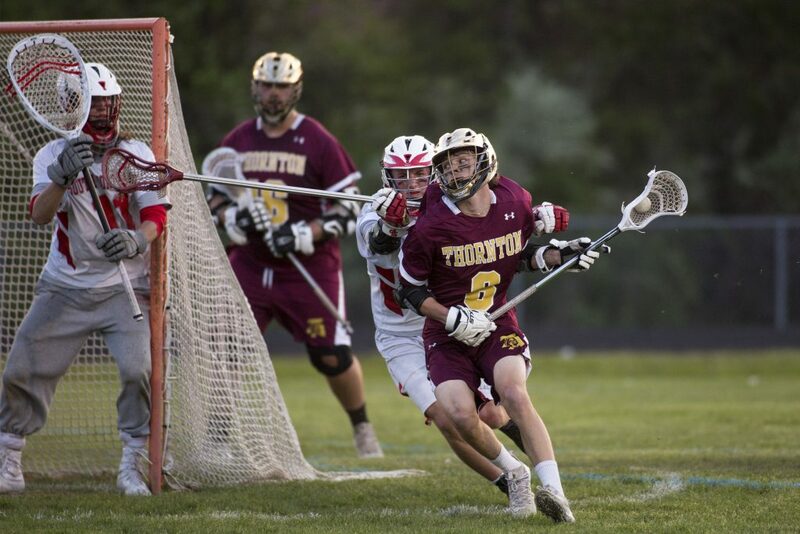 Ean Patry made 11 saves, and the Golden Trojans’ defense was overwhelming. 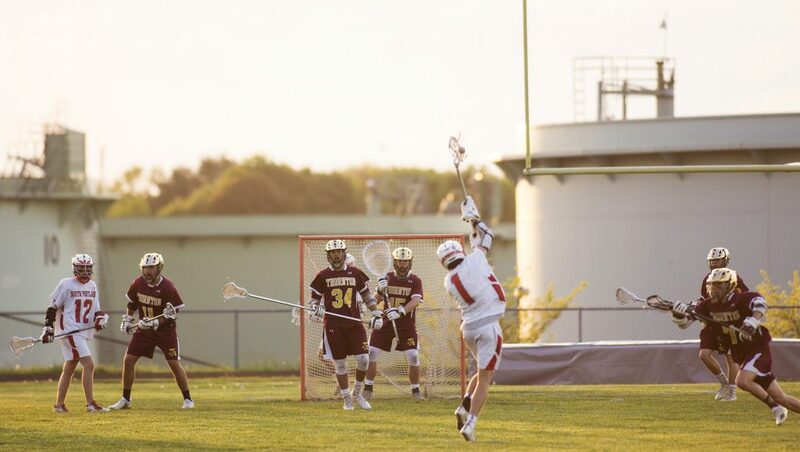 Quinn Watson made 14 saves for South Portland, but the Red Riots made life miserable for themselves, turning the ball over 32 times. “This one was particularly frustrating,” said South Portland Coach Tom Fiorini. “We just didn’t play well.